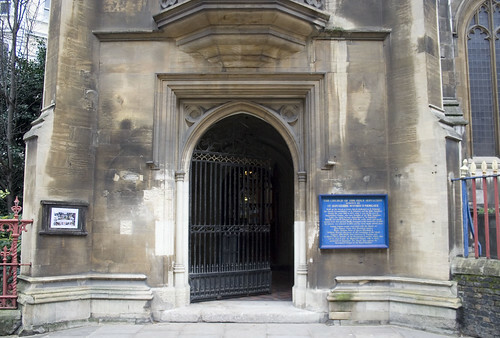 A large church stands on the corner opposite the Old Bailey and I have passed its locked gates for rather more years than I care to remember, for church that is open for a few hours each day during the week – has never been open when I am passing. I have recently passed by though and occasionally seen the perpetually locked gates ajar and upon entering been thwarted once more by the fact that the church within is being used for private music rehearsals. 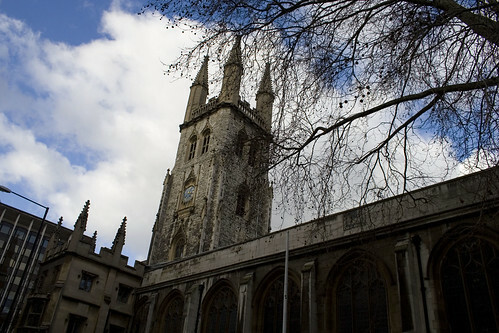 This is the church of St Sepulchre-without-Newgate and for years it has also been the site of a frustrated IanVisits-without-St Sepulchre. Until now. Passing on a Saturday lunchtime, the gates were ajar, and astonishingly, the doors were unlocked, and while the altar was set up for musicians, they were absent. In fact, it seemed that I had managed to arrive as they were off on a lunch break, as bags were scattered around, and actually a few people were in the church – who seemed to quite happy to totally ignore me. 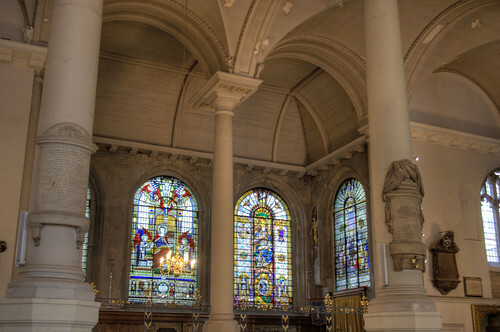 Despite its grand physical interior, and that there has been a church on the site since at least Saxon times, what you see is relatively modern — by English history standards — dating from the 1830s following restoration of a shell built in the 15th century. Much of the interior is given over to military memorials and banners, for this is also a regimental chapel, for the Royal Fusiliers, but it is a darker artefact sitting in a glass box near the altar which should cause people to shudder. This is the Newgate Execution Bell – which would be rung at midnight outside the cell of the condemned man on the eve of his untimely appointment with God. 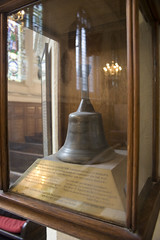 The main bells in the clock tower are also one of the “Cockney bells” of London, named in the nursery rhyme Oranges and Lemons as the “bells of Old Bailey”. Sitting on the other side of the aisle from the execution bell though, a more interesting relic, a lump of stone. But this was donated by the Orthodox Archimandrite in 1964. 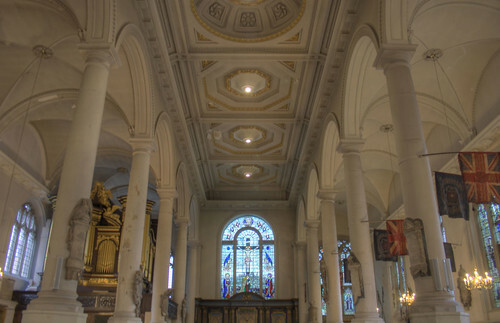 There is an aptness, as the church that it sits within was renamed as St Sepulchre after the same church in Jerusalem during the 12th century crusades. One of the characters I have wanted to see the grave of was that of Thomas Culpeper, an alleged lover of King Henry VII’s fifth queen, Catherine Howard. Executed in December 1541 he was buried in this church, but I was unable to find the grave – which was probably lost during subsequent rebuilding works. Around the back are some cottages, apparently former vicars residences and now rented out as offices. If you wander around though, beware of the gate – for tall people could find the bar unusually painful to bump a head on. As I left, a couple more musician sorts hurried in, and closed the metal gate. Once again I was Ian-Without-Church, and doors closed, I wandered off. Do take a moment to look around the corner though – that rather insignificant looking drinking fountain in the wall is quite historic. Some more photos of the interior of the church here. (Henry VIII’s wife surely though)! 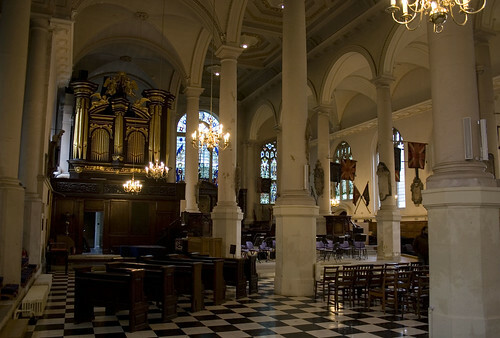 The frequent presence of musicians is explained by this being the National Musicians’ Church. The large Royal Fusiliers (City of London Regiment) war memorial is further down Holborn, but I believe there is a Korean war memorial plaque in the churchyard. I too have tried for years to get inside St. Sepulchre, with similar frustration. However, I finally made it in several months ago. There were a number of people setting up for an event that evening, but I was also left alone to explore as I pleased. It’s a lovely interior, and quite large. I didn’t know Culpepper was buried there! Thanks for the post and the photos.